Playful Lefty longs for a home with a cat buddy. Oscar, the eight-year old Caribbean potcake dog, is hoping for a new home in the New Year. He’s a small, tan dog with big ears and a very sweet temperament. Please contact the shelter to set up an appointment if you are interested in meeting this boy. We also have a lovely group of ladies lounging in the cat room. Tiger Lily is five years old, tabby and white, and just wants attention. If you’re looking for a snuggler she’s your girl. Mary is a petite tuxedo cat with long legs. At only one year old she would love a family to play with. She also has the cutest little half moustache. Our other one year old is Hunter. She is a very sweet and affectionate tabby. Although a little shy, she is warming up to people nicely and has become a purring machine. Stop by to see if you fall in love with any of these girls, or even just to give them some much needed attention. 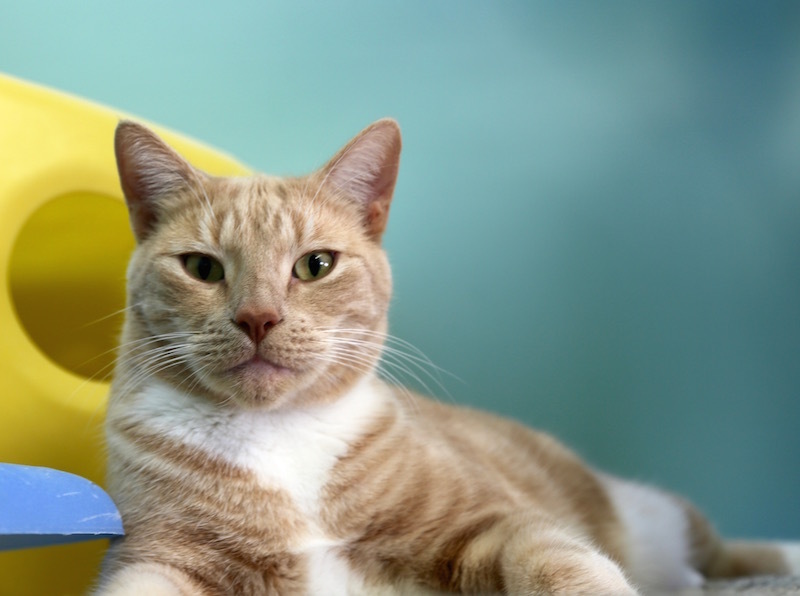 If you’re looking for a male cat Lefty could be the boy of your dreams. He’s a large buff and white who is only four and loves to play. He’d also be happy in a home with another cat to be his buddy. Lefty’s current buddy is Chaps, an 11 year old with very striking white and black markings. He has a very calm demeanor and would be a good addition to any home. All of the shelter residents, staff and volunteers want to extend best wishes to everyone for the coming year. Contributions are always gratefully accepted; the shelter is funded solely by donations. Please make checks out to The Animal Shelter of Martha’s Vineyard; the mailing address is P.O. Box 1829, Edgartown, MA 02539 or visit animalshelterofmv.org.